In this enhanced eBook Legacy Edition, readers will be able to experience, firsthand, the energy and love of life that made Randy Pausch so inspiring. They will also be encouraged to think more deeply about how they can apply its messages in their own lives. Download The Last Lecture Educator's Guide [pdf], written by Jeffrey Zaslow. Download a guide for reading groups [pdf]. Read the chapter that Randy cut from the book [pdf]. Read the full acknowledgements [pdf] that were mentioned on the last page. When Randy Pausch, a computer science professor at Carnegie Mellon, was asked to give such a lecture, he didn't have to imagine it as his last, since he had recently been diagnosed with terminal cancer. But the lecture he gave — "Really Achieving Your Childhood Dreams" — wasn't about dying. It was about the importance of overcoming obstacles, of enabling the dreams of others, of seizing every moment (because "time is all you have...and you may find one day that you have less than you think"). It was a summation of everything Randy had come to believe. It was about living. Watch the lecture that inspired the book. 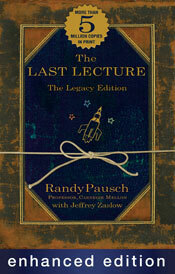 Listen to Randy read the Introduction of The Last Lecture [mp3]. Hyperion Books is proud to publish The Last Lecture. Buy the Audio Book in the U.S.
Hodder & Stoughton are proud to publish The Last Lecture in the U.K.